Don’t neglect the squat just because you workout from home. Even without a great deal of expensive home gym equipment, you can add this exceptional leg exercise to your home training program to burn fat and build muscle and strength. Bodyweight squats, as with barbell squats, are intended to work your legs – the gluteus maximus (glutes), hamstrings and quadriceps (quads). It is an effective exercise for building core strength. Because the squat taxes some of the largest muscle groups in your body, it also an effective overall conditioning and fat burning exercise. Just because you don’t have a gym membership or a well equipped home gym does not mean you cannot effectively workout your leg muscles. Try adding the bodyweight squat, or one of the other squat variations listed below, to your home training program. Begin from the standing position. Your feet should be just outside shoulder width with your toes pointed outward. Clasp your hands behind your head, inhale a breath and tighten your abs. Sit down into the squat as if you are sitting into a chair. Descend until your thighs are at least parallel with the floor. Your back should remain flat and your head and chest up throughout the squat. Keep your knees out. With your knees out you can easily sink into the hole allowing your hips to drop to the parallel position. Drive back up to the standing position explosively. To maximize the effectiveness of the squat on your quads, glutes and hamstrings, your hips should rise at the same rate as your shoulders. Continue exercise repetitions until failure. Not squatting deep enough:Squats are most effective when performed at least to the parallel position. 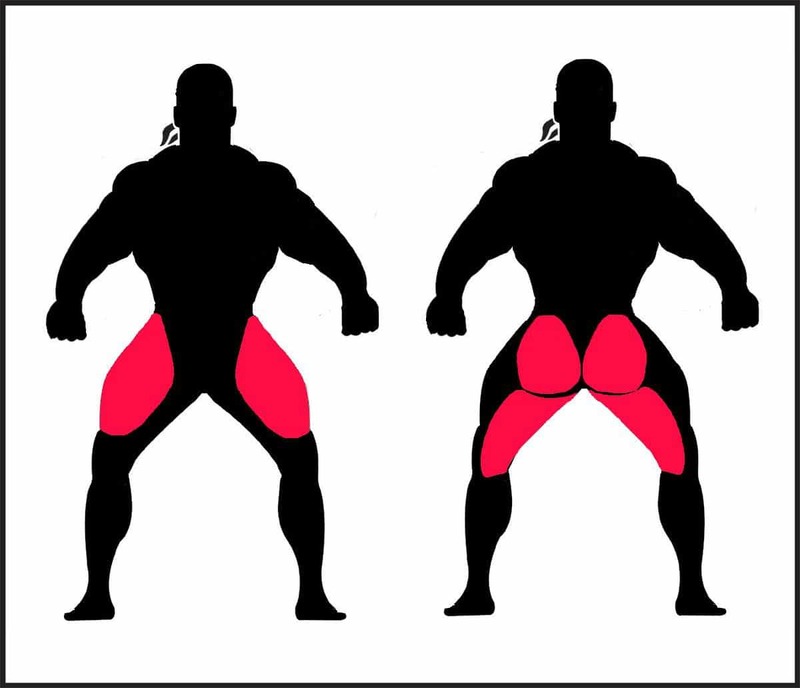 You can emphasize your glutes and hamstrings to an even greater degree by squatting below the parallel position. Failing to keep your knees out: Allowing your knees to buckle inward tends to force your hips backward. You may then find yourself leaning too far forward to compensate for your balance, and it will be more difficult to reach the parallel position. Additionally, you may find your hips rising at a greater rate than your shoulders, reducing the effectiveness for your quads, glutes and hamstrings. There are a number of effective variations of the bodyweight squat you can try in your home gym. These alternate versions of the squat require little or no additional equipment. Dumbbell Squats: You can add resistance to your squats by performing them while holding dumbbells. Perform the exercise in the same manner as a normal squat. Resistance Band Squats:Another relatively low cost method of adding additional resistance to your bodyweight squats is by using resistance bands. Perform this exercise with technique similar to dumbbell squats. Hold handle in each hand and stand on the center of the band as you perform your squats. Jump squats:Perform the descent as you would for a normal bodyweight squat. Drive up explosively, jumping straight up as high as you can. You can perform jump squats using dumbbells for additional resistance. Pause squats: Try pausing for 2-5 seconds in the bottom position. This can be performed with any of the squat variations.